If you visit London you will have a grand choice of restaurants to call in on and try their succulent cuisine. There are restaurants to suit everybody’s tastes from the meat lovers, to the children, to the vegetarians. Tibits works as a restaurant, bar as well as take-away. The restaurant is located near Piccadilly Circus, in the center of London, and, you can find it opposite the Absolut Ice Bar, it is an element of the Regent Street Food Quarter. Tibits is in association with Zurich-based Hiltl, which is known as Europe's oldest vegetarian restaurant, it is over one hundred years old. Tibits, however, is young and modern, the food has influences from Asia, India and the Mediterranean. The Tibits logo is simple, it says food that loves you back. The restaurant is set on two levels as well as having an outdoor dining area. The Food Boat restaurant is a completely different scene, it is set out as a buffet which you will weigh out the food. 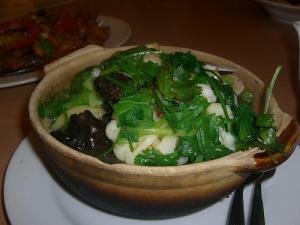 You have the option of choosing from forty fresh dishes that are hot or cold. And once you have chosen and filled up your plate you simply pay and weigh. At the food boat restaurant you can have a wide selection of beverage choices from tea and coffee through to fresh fruit juices, as well as alcoholic options such as aperitifs, cocktails, wine, beer and even cider. The restaurant is child friendly with its free babycinos. A Kids Lounge is set in the basement where there is a chalkboard wall for the kids to beautify, and there is also a lift to assist you and the buggy downstairs securely. This restaurant is in fact the oldest vegetarian restaurant around and it offers its clients a higher excellence of cuisine. It is a quiet, little restaurant in Primrose Hill. The meals do not look large but they are certainly filling and it is presented excellently. The ingredients in all the dishes served are without GM. The positives about this restaurant are that it is presented well, there are options for vegans and the dining standard is very high. The negatives about Manna restaurant are that it is not located in central London and it is rather expensive. The closest tube station is Chalk Farm. The lunch hours for dining are from twelve until three and the diner serving is from six thirty until ten thirty in the evening. Is it harmful to be on vegetarian diet while pregnant? Would any of you leave your children with strangers to go drinking???? Hello Guys ! I'm very health conscious person. Systemic lupus erythematosus causing photosensitivity, options? Vomiting 3 1/2 hours after seafood- like clockwork!